A brief moment of self-indulgence if you'll let me. 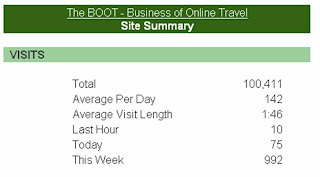 A couple of days ago (without me noticing) we hit a speedometer moment here at the BOOT as we crossed over the 100,000 visitor mark (according to site meter - image above). It is very hard with all the syndication that I do and RSS readership that I have to determine total reader numbers but am very happy with the pure visitor stats. Well done Tim . I always enjoy reading your blog its great to see the success of your blogging. 100K visits for a trade blog is a huge number. Thanks Craig. I am having a blast writing and amazed and the people I have met because of it. Yes but how have you made money ? I too have enjoyed your blog and the conversations that come from it. It increases your importance in the market and helps build your personal reputation. This is not about making money from directly from the blog but about the other opportunities that arise from being a leading figure in a community. That is a great number! Madame BOOT and the BOOTies. sounds like your domestic bootcamp is laced with a bit of sole, given the high ankle support as opposed to the boostrap. Well done Senor Boot ! I think you should celebrate with 100 beers, oh, ok maybe a 100 shots...mmm...ok maybe just a quiet ale and a few lazy United surveys to fill out for fun.